This is a chart for students to self monitor their progress through the Rebecca Sitton Word list. To use it: test the student, have them color a level for each list they have mastered. then have them mark the appropriate place on the graph for the list they have not mastered. Have the student start studying the words they don't know and progress monitor them weekly. 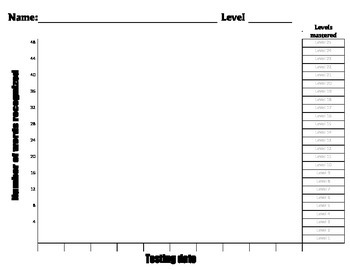 after each progress monitoring the student marks the graph appropriately. After they have mastered the list they color in the next level and get a new graph for the next level.